Tom Nichols (57) is a professor at Harvard, a Sovietologist, a former Senate aide, author of “The Death Of Expertise”, 5 times undefeated Jeopardy champion (!!!) and, according to his Twitter bio, one of Politico’s Mag “Politico 50” for 2017 — whatever that means. The Dunning–Kruger effect is a cognitive bias wherein people without expertise or experience in a particular field suffer from illusory superiority. What you’ll also find in this podcast are a slew of Dunning-Krugery, many other cognitive bias, lies, mind-reading episodes and a lot of straight-up hallucinations. Min 17.28 Tom Nichols: “…Lay people don’t understand that, yes, experts have to be challenged all the time because they get things wrong but they have to be challenged by other experts who understand that field and understand the evidence in that field…” — remember this principle proposed by Tom and agreed by Sam, it will be useful as we move forward. Min 25.27 Tom Nichols: “.. You don’t get on a bus and breathalyze the driver… you don’t assume that your letter carrier is stealing your packages, you assume that he or she is a professional who has been delivering packages for a long time and knows how to do it, you don’t walk into your children’s school assuming that everybody faked their teaching credentials..” — Well Tom, the reason why we don’t breathalyze bus drivers is because we all instinctively know that they have #SkinInTheGame, insofar as their incentives, don’t get fired and get home safe perfectly matched those of the passengers. As for the “stealing packages and faking teaching credentials” these are not expertise problems (as he cleverly tries to convince you) but moral ones. Also notice the “we don’t assume everybody faked their teaching credentials” which is an Absurd Absolute designed to make those who disagree with Tom sound crazy. Min 29.00 Sam Harris “.. Everything that didn’t go wrong (re: Vietnam War) was also secured by some form of expertise..” — Another use of the Absurd Absolute in the effort to convince the listener that success is due to expertise (unless is Trump’s) without the necessity of providing any evidence. Min 29.21 Tom Nichols “… there’s a million things that go right every time you take a successful flight…” — Again, conflating experts with #SkinInTheGame with all experts: pilots and airplane companies have all the obvious incentives to bring you, the plane, the crew and the pilots home safe. Min 30.27 Tom Nichols “I think it was Nate Silver who said Hillary had a 2 in 3 (66%) chance of winning…” — Somehow Tom leaves out (don’t remember?) that the same Nate Silver, who is (was?) widely recognized as the expert of polling and political forecasting gave Trump a 2% chance of becoming the GOP candidate. Min 40.18 Tom Nichols “… I want a cabinet much smarter than America, much better than America and I’ve been accused of being a defender of elitism, well so be it, I don’t want the cabinet to be people just like me, I want the people in the cabinet to be much more competent, smarter, of higher character and steady mindedness than most of the rest of us” — Notice how Tom is proud to be a defender of elitism, which is portrayed as good and necessary in a cabinet. Min 42.18 Tom Nichols “If you look at the current administration (Trump) you have a bunch of people that are the elite of the elite, I mean this is Hollywood, Wall Street, pretty much running the government and saying “we’re here to do the bidding of the people of Louisiana” and that’s a lie, that’s nonsense..” — Some of the Trump cabinet members are indeed Wall Street figures but Hollywood? Here Tom is hallucinating that Hollywood is on the side of Trump (!!!) Also, what happened to wanting an elitist cabinet from just 2 minutes ago? Min 42.36 Tom Nichols “… and that has really become part of the attack on expertise which has been led by people who actually have quite a lot of knowledge and education themselves and are just cynically mobilizing this for political purposes… this is just a cynical attempt to basically tell people that the world is a simple place, nothing is your fault, bad people hurt you, all answers are solved with hats and banners, and yet, when they close the door I’m sure they shrug and say “well, that went over well” knowing what they putting forward is nonsense and that scares me more than anything” — Here you can witness a complete departure from facts (remember Tom wrote a book called “Defending The Experts”) and a clear episode of mind-reading, which is then rationalized by (inadvertently) admitting that the hallucination is derived from the strongest emotion there is: Fear. Min 46.02 Tom Nichols “.. Trump is genuinely clueless..” — Here the guy who wrote endless articles on why Hillary Clinton should have become President calls the guy who actually won the election genuinely clueless. Notice how in their worldview the possibility that the President of the United States, being the most powerful billionaire on earth is a “genuinely clueless monster of incompetence” and 62M+ American citizens are uniformed immoral fucks is infinitely more likely than the possibility that a neuroscientist and a jeopardy champion have simply got the election wrong. Min 49.36 Tom Nichols “This is why we also living through a revival of conspiracy theory in America, because that’s comforting to people” — Of course, for the experts, Trump colluding with Putin to steal the American election is not a conspiracy theory at all. Notice however how he nails the psychological explanation of Conspiracy Theories: to comport people, to comfort people that are scared, do you know anybody that’s really scared? Min 51.43 Tom Nichols “.. Trump who has no inner monologue and he’s totally unable to have a thought..” Two absolute absurds and an extraordinary case of of mind-reading in one single sentence. Not bad. Min 51.53 Tom Nichols “Conspiracy thinking is a response of the aggrieved ego that says: something terrible happened and I can’t comprehend, so I will come up with a comforting theory that makes me powerful…It’s kinda of what everybody wants to be now “I’m the guy who knows stuff” — Well, well, does this description remind you of anyone? 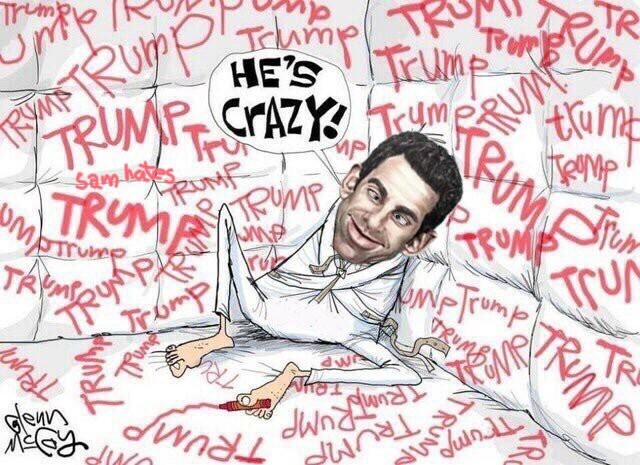 Min 52.41 Sam Harris “Let’s talk a little bit more about this current moment, let’s hit foreign policy and the prospect of war..” Sam completely bypasses Tom’s indictment of conspiracy theorists and switches argument immediately. Min 53.50 Sam Harris: “Tillerson now has his reputation, more or less, destroyed by contact with Trump, it’s almost like Trump is made of anti-matter, he destroys everything he touches.. and yet he’s fine, none of this blows back at him because there’s some tens of millions of people for whom there’s no possibility of misstep” — Sam arrives at this conclusion from the false knowledge that Tillerson was fired and doesn’t provide any examples of Trump destroying everything (Absolute Absurd) We’ve officially left the realms of facts and entered the world of Sam mind-reading tens of millions of people using false premises. Min 54.55 Tom Nichols “How many times do people in business have to fail in government before we get it through our head that business and government are two different skillsets” —Tom completely discounts that this time there’s a businessman (Trump) appointing other businessmen, which never happened before, he also ignores that the worst tragedies of the 20th century were caused by politicians and their experts advisors, not businessman in government. I know at this point it’s almost redundant to point out that Tom has no expertise in business or government, but since we’re keeping track, here’s another #DunningKruger point. Min 57.42 Tom Nichols “If the Trump administration is in meltdown and we’ve become so inured to failures that we’re almost shrugging at the fact the first National Security Advisor just got walked into court this morning” — From the alleged meltdown and all of the failures, Tom only cites that Flynn, who was fired by Trump for lying to Pence, walked into a court because he also lied to the FBI. That’s it! No further evidence is provided for the nonchalant claim that Trump White House is in meltdown. How do I know they’re hallucinating? I’m glad you asked. The stock market is up 30% since inauguration day, you think people on Wall Street wouldn’t notice if the White House was in meltdown? Min 58.13 Tom Nichols “Republicans are riding this meltdown all the way down to see how much they can get out of it before it all crashes” — To keep his worldview intact he’s now also reading into the mind of Republican senators and convicting them of irresponsible cynicism and total disregard for the fate of the country and their own political future. Min 71.11 Sam Harris “Do you think Twitter should cancel his account? You could make a case Twitter is quite irresponsibly giving a platform to someone who’s misusing it in ways that could cause real harm, probably have already caused real harm, certainly have caused harm to the stature of the presidency and the standing of our country. Is not hard to imagine that we could led into WW3 because of something Trump does at 4 in the morning with his smartphone..” — Notice how, once again, the criticism comes from imaginary crimes and unrealistic future events. Clear signs of an hallucinating mind. Also worth pointing out that despite having 1 year worth of “monster of incompetence” President Trump tweets, Sam still needs to resort to subjective categories like “stature of the presidency and the standing of our country” to make his point. Min 89.39 Tom Nichols “I still think he never intended to win the election, this was all kind of a joke” — Pause it. We’ve now reached peak hallucination. What Tom is implying here is that a 70 year old multibillionaire who was respected by almost everybody, had a supermodel wife, 5 kids and 10 grandkids one fine day decided to risk his reputation, his family safety and future, his business empire, put more than $100M of his own money and campaigned even 3 times a day for a joke (!!!) and on top of that 62M American adult citizens (including billionaire geniuses like Peter Thiel) fell for it. But not Tom. Tom knows the real truth.